Synopsis: Translated into over 50 languages, The Purpose Driven Life is far more than just a book; it is a guide to a spiritual journey that has transformed millions of lives. Once you take this journey, you’ll never be the same again. On your journey you’ll find the answers to 3 of life’s most important questions: The Question of Existence: Why am I alive? The Question of Significance: Does my life matter? 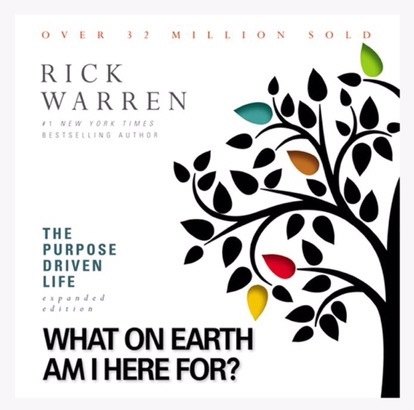 The Question of Purpose: What on earth am I here for? Pastor Rick is actually my pastor! I go to Saddleback Irvine South, which is one of his church’s several campuses in Southern California (though there are some outside the country). I’ve heard him and other pastors mention this book on different occasions. My roommate even told me that my pastor (before I knew) was a well-known pastor and has one of the biggest congregations in the country! I had no idea that my pastor was such an influential and successful person. He’s also claimed to have read tens of thousands of books over the course of his life, which is apparent as he comes across as a very learned and intellectual, as well as compassionate, person. Needless to say, I’ve felt compelled to read his book for a while now. A couple weeks ago, pastor Rick actually told an anecdote about how this book helped Olympic swimmer Michael Phelps get out of depression and get out of retirement and back to training for the most recent Olympics. Although I am a Christian and I imagine I will get a ton of value for myself (mentally, emotionally, and spiritually) out of this read, I’m also determined to draw some of the key nuggets that can add value to anyone else no matter what their beliefs are.